A Nanobot is a force that, if put together with enough Nanobots, can change everything. A Nanobot is commonly referred to as “the little guy”. Well guess what, we are enough “little guys” to change music! We support Local and Independent Music! We Are Nanobots! 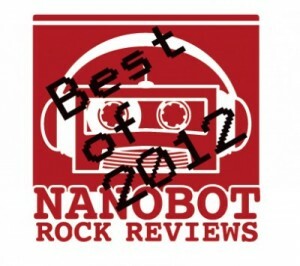 Of the 117 albums we discovered here at Nanobot Rock Reviews in 2012, we asked you to select what you believed was the best. Thank you very much to all those who voted! We can’t wait to see what we discover in 2013! Jared Finck! Such a great record, thank you Nanobot! Good year to be BLUE… SERIOUSLY THOUGH all these bands Deserve to be where they are… A lot of talent out there.. Thank you to everyone who voted for us and Others and I hope we get to meet all of you sometime SOMEWHERE! NANOBOTROCK RULZ..